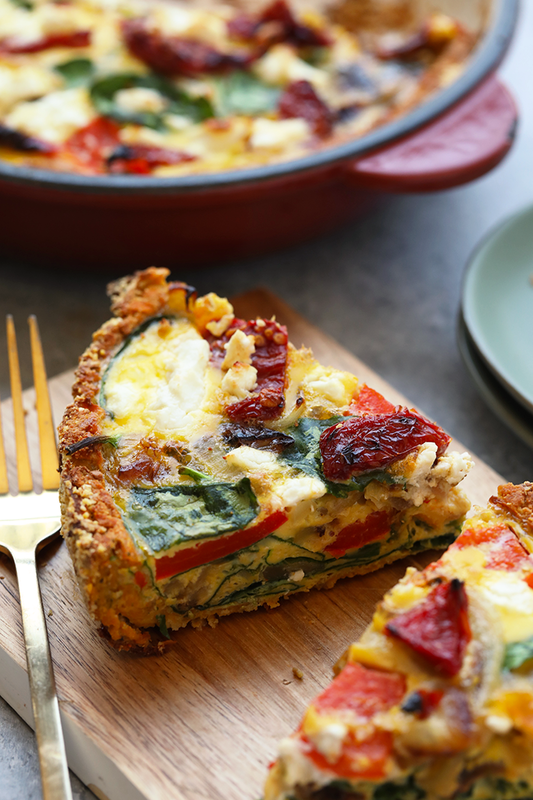 Breakfast is served with this delicious, gluten free quiche! 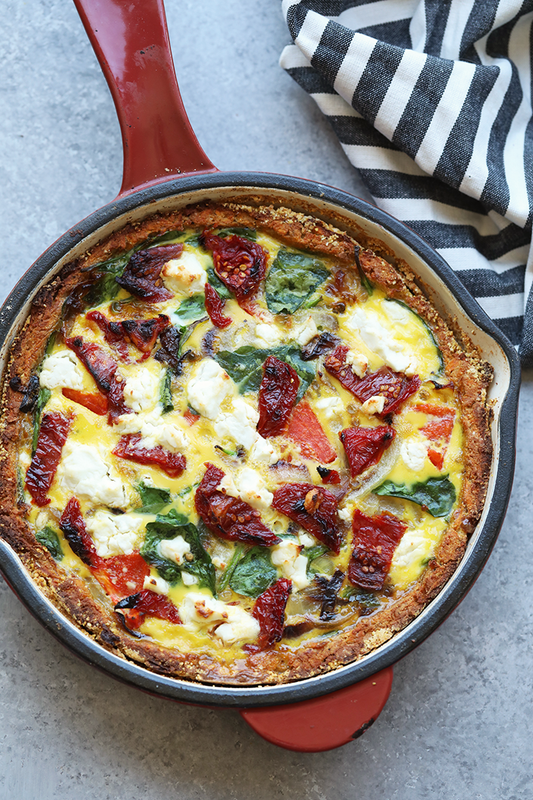 That’s right, this sweet potato crust quiche is gluten and grain-free making this vegetarian breakfast protein and veggie packed. 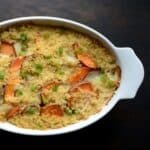 The crust is made with grated sweet potato and almond flour AKA you’ll never go back to the classic quiche crust again! This. is. the. quiche. of. all. quiche. 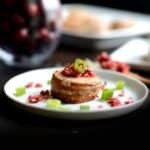 When I leave recipe development 100% up to Linley, this is what Fit Foodie Finds gets…pure AMAZINGNESS. When I was in Costa Rica in March, I got a text from Linley about the most legit sweet potato crust quiche on the planet. I never doubted her for a second that it was THE BEST and then…I fell more in love after the first bite. This quiche is gluten and grain-free, made with a sweet potato + almond meal crust. I mean, come on. Do those two flavors get any better? Yes, THEY DO. The spice combo in the crust is so yummy. We used a mixture of sweet and flavors to really give this recipe a punch. Think garlic meets cloves. Sounds a little weird, but I promise it works! The trick to this crust is actually ringing out as much moisture as possible from the sweet potatoes so that it can bake a little bit before the rest of the ingredients get added in. We used a cheese grater to shred the sweet potato…it works like a charm. You’ll notice that we sprinkled some cornmeal on our cast iron skillet and we did this is for 2 reasons. 1. So that the quiche easily removes from the pan and so that there’s little to no stickage and 2. Crunch! Cornmeal gives it a little extra texture and flavor. Note that if you’d like this recipe to be 100% grain-free you can swap the cornmeal with almond meal. Once you make the crust, the hard part is pretty much over! Then, it’s time to add in #alltheveggies. In this recipe, we went with spinach, red pepper, and caramelized onions. DO NOT SKIP CARAMELIZING THE ONIONS. I REPEAT. DO NOT SKIP. We have a super simple tutorial on how to caramelize onions in the oven video on FFF and I hope it changes your mind about the difficulty of caramelizing onions. Truth be told, you can use any vegetables you want…but this combo was killer! I feel like I could continue pumping up this sweet potato crust quiche, but you just need to make it for yourself! You’ll never want to eat another kind of quiche. Preheat oven to 425ºF and wipe a 9-inch circular pan (we used a cast iron that is 2.5-inches in depth) with olive oil and sprinkle with cornmeal. Set aside. Start your crust by placing grated sweet potato in a medium-sized bowl. Sprinkle with 1/4 teaspoon salt and let sit for 15-20 minutes. You do this to draw the moisture out of the sweet potato before forming our crust. Place sweet potato in the middle of two paper towels and twist. You should be able to wring out any access liquid. Note that some sweet potatoes are moister than others. Next, place sweet potato in a medium-sized bowl with all other crust ingredients and mix well. Use your hands to form a ball with the sweet potato mixture. Place sweet potato ball onto the pan and use your hands to flatten the sweet potato ball into a crust for your frittata. It should cover the bottom and halfway up the sides. Place in the oven and bake at 425ºF for 20 minutes. Remove crust from oven and let cool. While crust is cooling, prep all vegetables for the frittata. Measure out 2 cups of packed spinach, caramelize a large white onion, and chop a red pepper. Set aside. 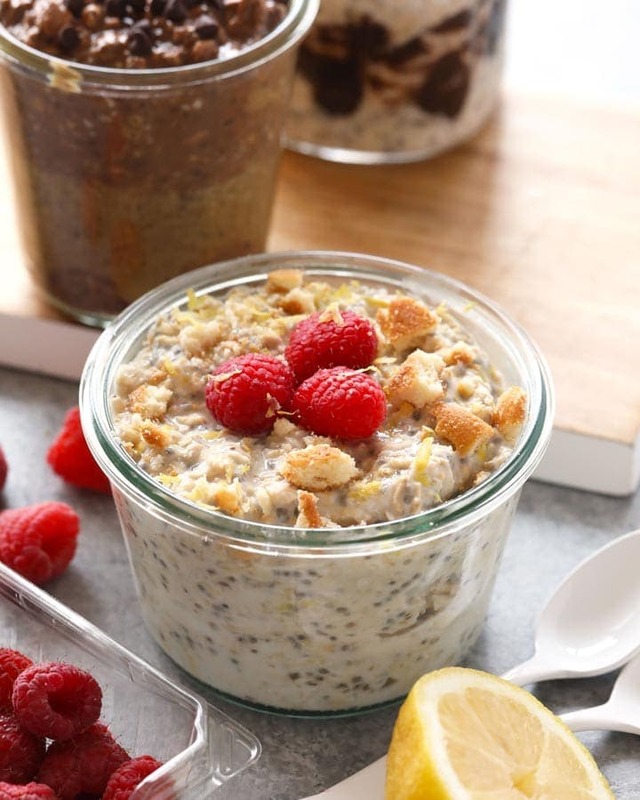 Place 8 eggs and 1/4 cup of almond milk into a medium-size bowl and whisk. Next, place caramelized onion, spinach, and red pepper on top of the sweet potato crust and pour egg mixture over the veggies. Use your hands or a spatula to make sure the veggies are submerged in the eggs. Top eggs and veggies with sun-dried tomatoes and goat cheese. Cover with tin foil and bake for 20 minutes at 425ºF. Remove tin foil and bake for an additional 10-15 minutes. *To make this recipe grain-free you can sub almond flour for the cornmeal. **Nutrition information includes an additional 4 tablespoons of olive oil for the caramelized onions. See THIS recipe for reference. Check out some of our other egg-based recipes!